The best Freestyler skiers will demonstrate their tricks on November 12th, 2009 in the Snow Park at Glacier 3000. 24 Freestylers will be competing for the title of &ldquo;King of Glacier 3000&ldquo; at the Glacier 3000 Invitational. Before winter has officially even begun, the top Freestyle skiers will be competing on November 12th, 2009 in the Snow Park of the Glacier 3000 ski area. The 24 riders will be coming from 10 different countries and among them will be Elias Amb&uuml;hl from Switzerland (2nd place Freestyle.ch 2009) and last year's winner Henrick Harlaut from Sweden. On Wednesday morning, the riders can practise in the Snow Park for the first time and in the afternoon there will be a public jam session. This is a great opportunity for rookies and all freestylers to personally meet the pros, talk with them and to get helpful tips. After the warm-up on Thursday morning, the Slopestyle contest will begin at 10.00 h. The judges will primarily focus on the technique and creativity of the demonstrated moves. In the qualifications, each participant can show his tricks in two runs. Afterwards, the eight best riders will compete with one another in the finals. The winner will receive CHF 5&rsquo;000 in prize monies and can call himself the &quot;King of Glacier 3000&quot;. By having this event at the beginning of the season, Glacier 3000 is not only promoting Freestyling but also wants to draw attention to this sport to the general public. The Snow Park&rsquo;s glacier location is ideal and therefore this promises to be a great show. 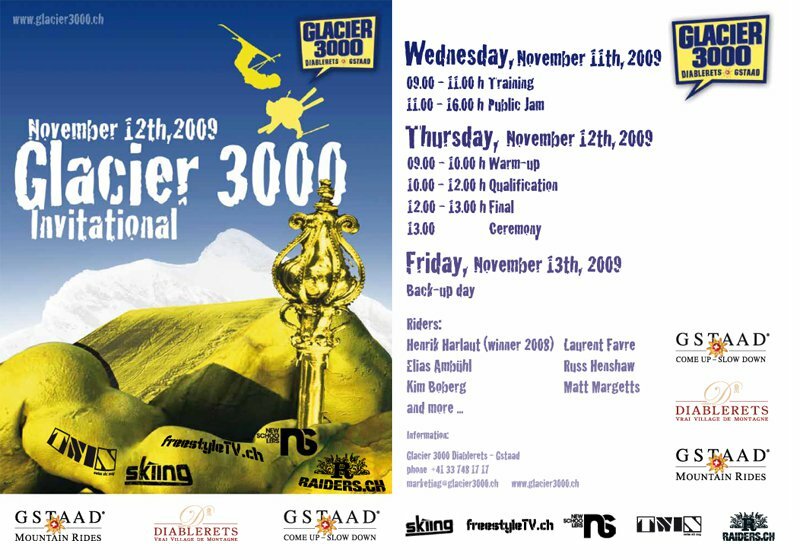 Therefore, the Glacier 3000 Invitational is the place to be on November 12th, 2009.